Your new go-to weeknight pasta. Right here. This is it. This is she. This be her. What? And it has heavy cream in it so you can go ahead and do a triple axel twirl throw jump toe pick. 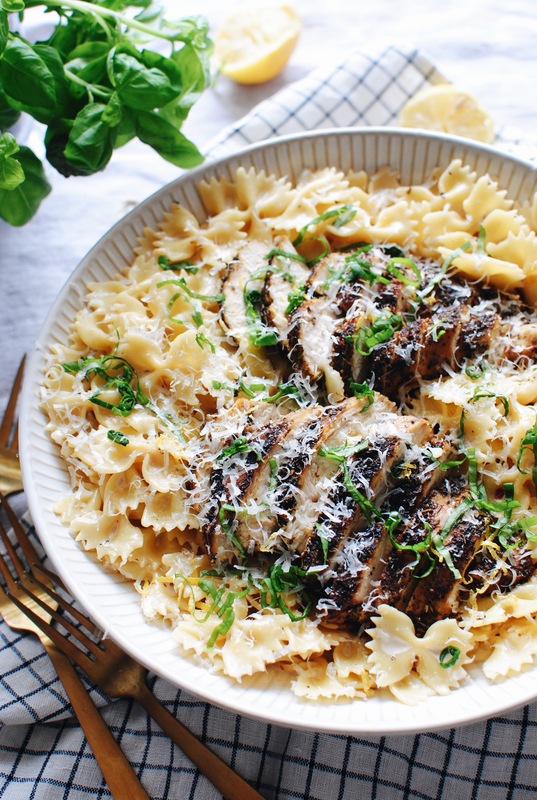 This pasta dish is EXACTLY what you want in a . . . well, pasta dish. The sauce is perfection. Not too thick and gloppy, not too thin and pathetic. I used heavy cream because it’s still winter and our bodies require a certain amount of cream to keep us joyful. The cream and lemon and tiny bit of pasta water come together in harmony to create a sauce of sheer, pimp lusciousness. But hold on I’ll get to that. This is so simple! Take some chicken breast and cover it with an insane amount of dried Italian seasoning. To where you basically blacken the chicken. 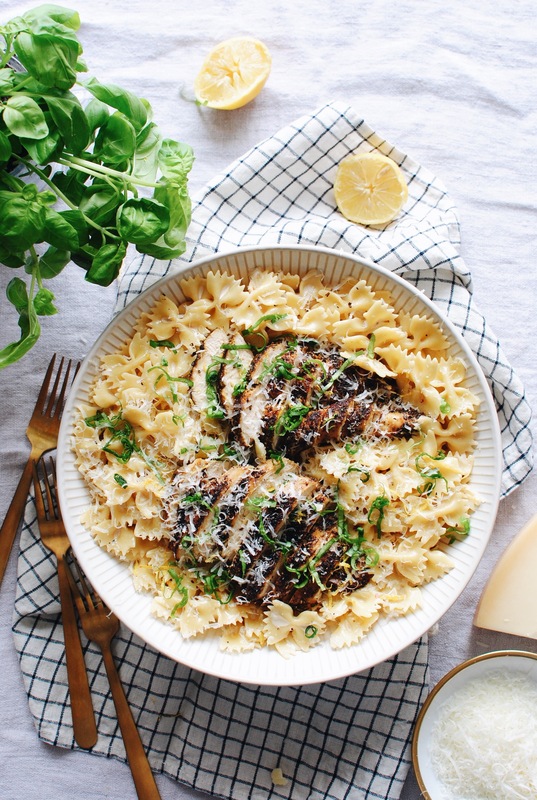 Because you see, seared blackened chicken breast and a lemony cream sauce clinging to bow-tie pasta is life achievement. Nothing better. Don’t try to argue with me. Oh, AND BASIL. There’s fresh basil in this mess. 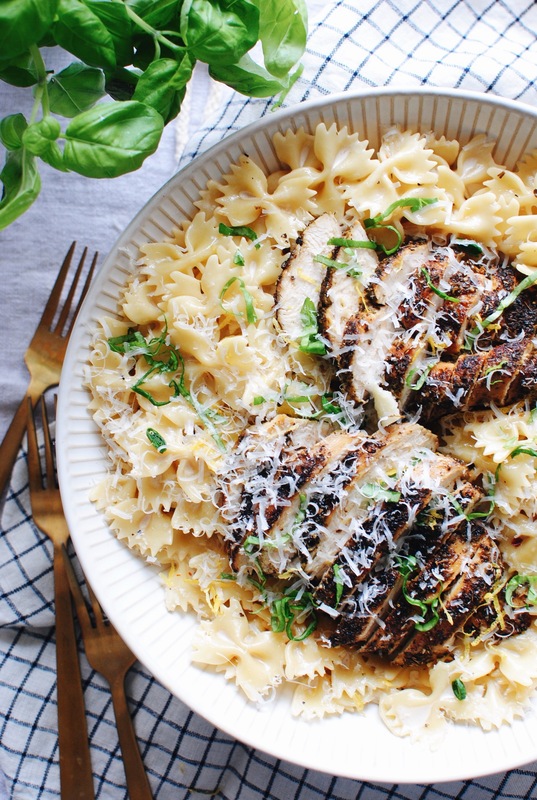 Which makes it an any-time-of-year meal, especially if you have an ish-load of basil in your summer garden. Thing is, if you eat this meal in the winter, like now, it will satiate your craving for warmer days. And you will experience deep stomach glee. You’re like, please never say “deep stomach glee” again. 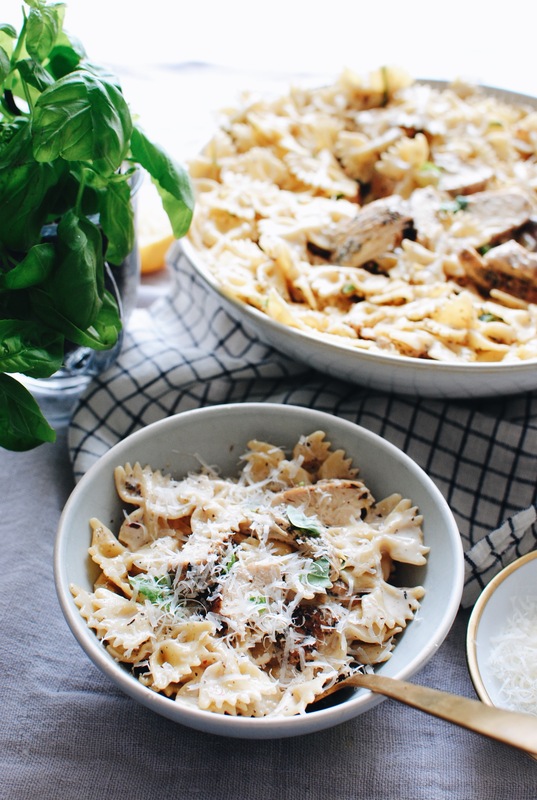 Do you say farfalle, or bow-tie pasta? I never know what to call it. Or butterfly pasta! What about butterfly? I just call it GET-IN-MY-FACE pasta. And that is IT, bunnies. 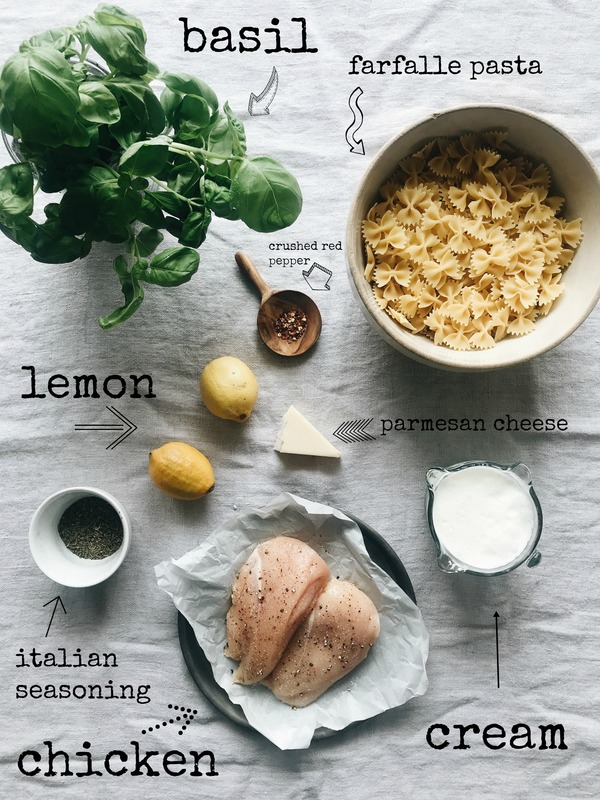 Sear your chicken, boil your pasta, create the sauce, garnish with so much basil and parmesan cheese that you forget you have a torso. I can’t tell you how much the lemon and basil smooch up in the sauce and create creamy babies of bliss. It’s just perfection. You’ll bawl forever. Annnnnd this is what it will really look like once you mix it all together like a normal humans. Minimal prep and even more minimal cleanup. Your new go-to weeknight meal. Rub the Italian seasoning all over the chicken breasts. Bring the extra-virgin olive oil to a medium-high heat. Sear the chicken on both sides until nearly blackened and cooked through, about 5 minutes per side, covered. Remove the chicken from the pan and set aside. To the pan, add the heavy cream, the juice from one lemon, the crushed red pepper and a good pinch of salt. Let simmer on a medium heat for about five minutes. Quarter the other lemon for later. 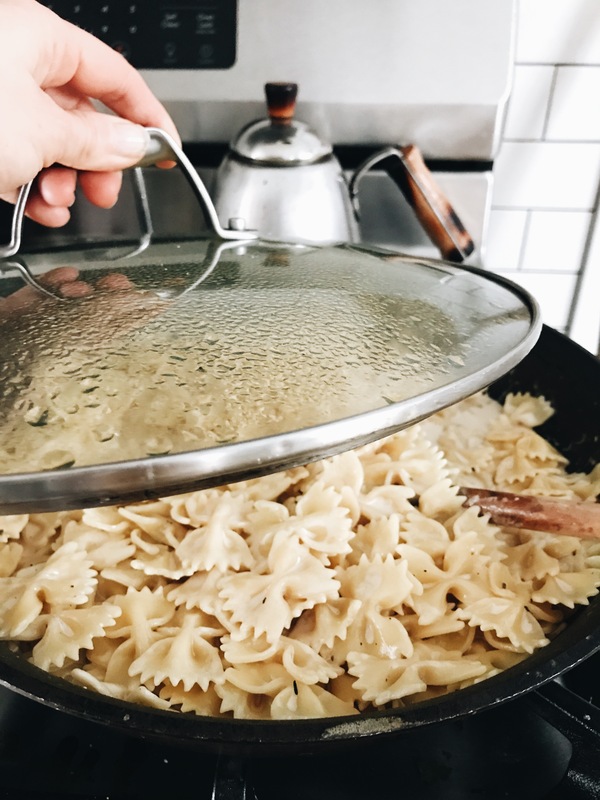 Cook the pasta until al dente, then transfer to the cream sauce. If the sauce is too thick, add about 1/4 cup of pasta water to thin it out. The starchy water will add more depth to the sauce. Toss it all together, and take it off the heat. Add 1/3 cup grated parmesan, and give it another toss. If you need to cover it and let it sit for five so that the sauce can thicken, do that. It might be ready now! Taste it. Need more lemon? More salt? Adjust the flavors to the point where you’re on the kitchen floor bawling. 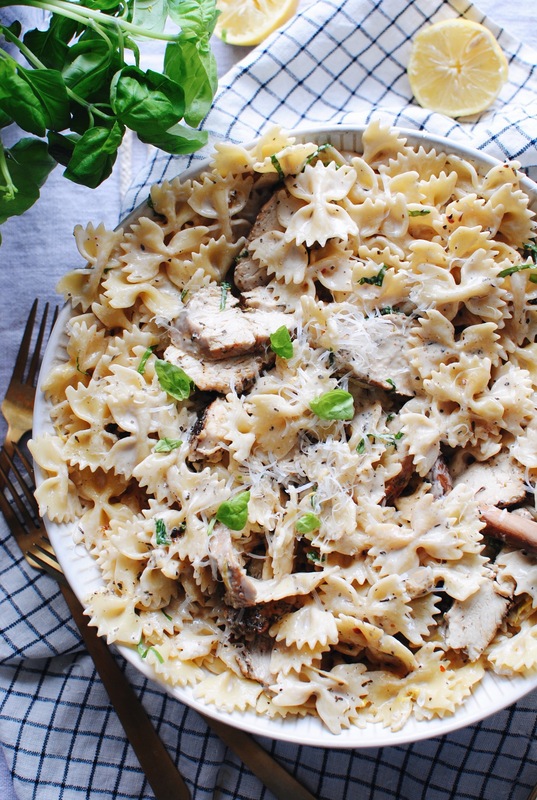 Transfer the pasta to a serving bowl, and place the sliced chicken on top. Garnish with thinly sliced basil (or whole leaves! ), more parmesan and extra lemon wedges. This is going to CHANGE YOU. Remember the whole triple axel twirl throw jump toe pick thing I mentioned? Yyyyyeppers. Well this looks amazing! I’m going to be totally honest, out of all of the food blogs I follow, yours is the only one I actually read the whole post and not just scroll right to the recipe. I love reading your blog, it’s funny AND gives me idea for meals. Thanks for all you do! Yuuuuuum. This looks/sounds so good. I could eat basil in just about anything! I bet pairing it with the lemon and the cream is incredible. Definitely going to be trying this soon. I made this tonight for dinner and it was SO good! Thank you!! 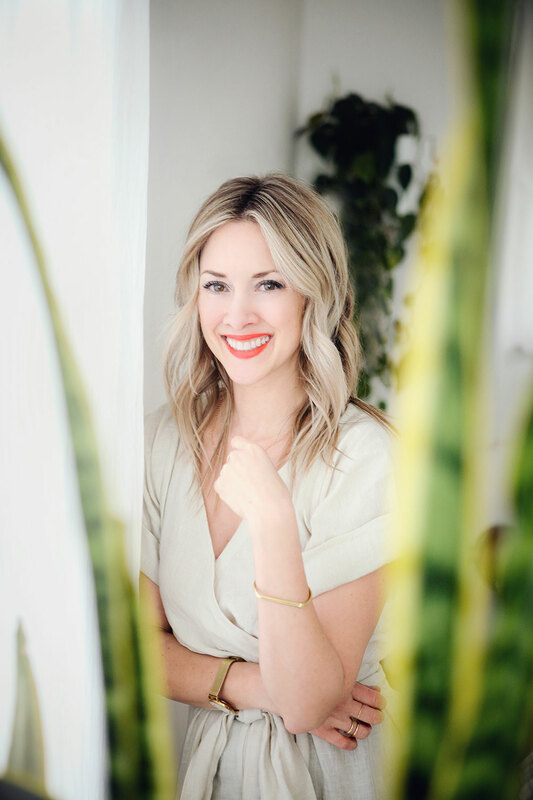 Also, how in the world do you have time to make beautiful food, photograph it, blog about it, Instagram/video thing you do (you are so hilarious, you make my day when I see that little rainbow circle around your pic! ), respond to comments, raise kids, etc etc?! I don't know, you're pretty amazing. Ok that's all. Have a great night and thank you for the recipe!! Like your style :-) Thank you ! I made this a couple of nites ago and it was fantastic! And so easy. Thanks for this great recipe - it'll now be in the regular rotation in our household. This looks so good! 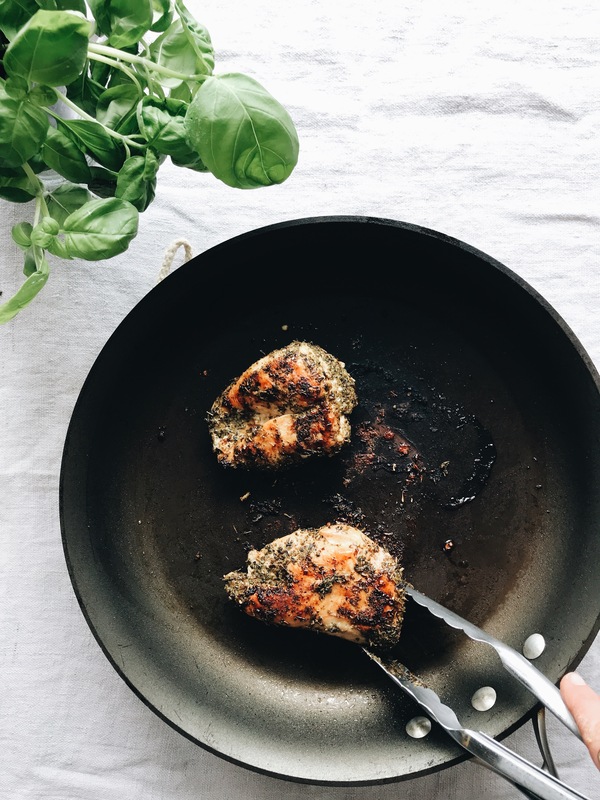 I love the idea of infusing the spices into the chicken on the skillet - and the light in your kitchen is gorgeous! This website online is known as a walk-by means of for all the info you wanted about this and didn't know who to ask. Glimpse right here, and you'll definitely uncover it. I been exploring for a little bit for any high-quality articles or blog posts on this sort of area . Exploring in Yahoo I at last stumbled upon this web site. Reading this info So i am happy to convey that I have an incredibly good uncanny feeling I discovered exactly what I needed. I most certainly will make certain to don't forget this web site and give it a glance regularly. YESS GAWDD I just made this on Saturday and by golly (I'm 25 going on 90) is my life changed! SO stinkin good. Also there's a very real possibility it has magic powers. My boyfriend ate it the night before his first 10 mile race (don't ask me, i don't understand these over-achieving runners) and not only did he finish, he beat his expected time and felt so great that morning. Magic. Pasta.